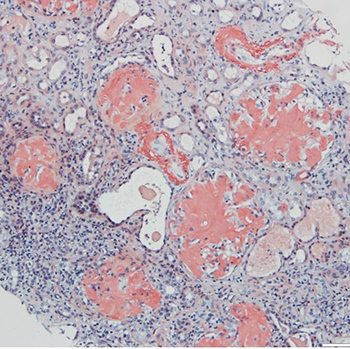 Valentin R, Gurtler K, Schaker A. Renal amyloidosis and renal failure–a novel complication of the SAPHO syndrome. Nephrol Dial Transplant 1997;12:2420–2423. Rukavina I. SAPHO syndrome: a review. J Child Orthop 2015;9:19. Sasha D, Girouard BA, Rodney H, Falk MD, Helmut G, Rennke MD, et al. Hidradenitis suppurativa resulting in systemic amyloid A amyloidosis: a case report and review of the literature. Dermatol Online J 2012;18:2. Firinu D, Garcia-Larsen V, Manconi PE, Del Giacco SR. SAPHO syndrome: current developments and approaches to clinical treatment. Curr Rheumatol Rep 2016;18:35. Garcovich S, Amelia R, Magarelli N. Long-term treatment of severe SAPHO syndrome with adalimumab: case report and a review of the literature. Am J Clin Dermatol 2012;13:55.